This is a basic breakout. Using the 30-Pin plug, lots more can be done. Be sure to google "30-pin ipad connector", "iPodPinout", "iPad/iPhoneGuitarCable" and "DIY iRig". Firewire and USB (MIDI) are both here, ready to be accessed. 1- In the model shown, pin 11 is tied directly to pin 1 (ground) within the breakout plug housing (this is covered in the following tech notes as well as the youtube movie). Tying pin 1 to 11 activates the iPad's line activity, thus the connection. However, for the mic/guitar input to activate, the 1-11 connection must be broken. I simply pull the 30-pin plug back a little, the 1-11 connection opens, and my mic/guitar input is recognized. Next time, I would run an extra wire from the 30-pin to the desk housing. With the wire soldered to pin 11 it could now connect to ground at the desk, through a switch or a switched jack. Turn the switch off when a guitar is plugged in. Or, using a switched jack, 1-11 is broken the moment a plug is inserted. I've run guitar through this input as well. While powerful-sounding, and working with the iRig apps, guitarists will appreciate a better balanced input, a subject much discussed online (google iRig DIY and such). I will probably upgrade this input. This was a 1-night hack. A quickie. I worked off of a chart naming all the functions of the iPad's 30-pin port. It is not intended to be a superdock, nor a replacement for the nice Alesis studio dock. It is simply a quick audio upgrade that anyone can do in a jiffy, instantly improving the iPad's usability on stage or in the studio. Very cheap, very cool, very functional. 1- The 3 stereo pots are not needed. The ones I used (unmarked) serve only as trimmers. 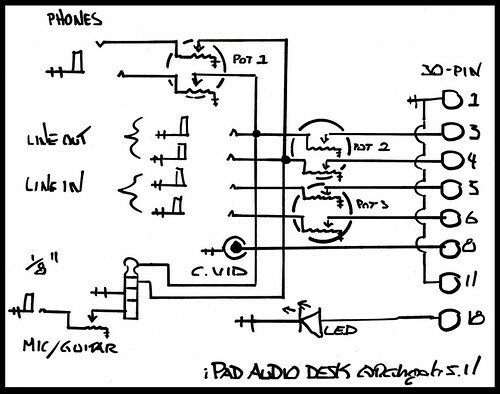 The audio path is usually cleaner without passive pots. 3- I wire monitor to actual line out - I like to know I'm monitoring actual board/amp feed. 4- Monitor and lines are output to both 1/4" mono and 1/8" stereo jacks. 5- Grounding: all 16 grounds connect to pin 1 of the breakout plug. 6- Note that pin 1 is tied to pin 11 on the 30-pin plug. This activates line activity (see revisions at the top of this page). Top row of pins are odd-numbered; bottom are even-numbered. 7- LED is a high-brightness blue, ripped from a set of Christmas lights. The chrome lens is a vintage cold war pilot lamp housing. This hack works fine on my first-gen iPad2. The 30-pin has been through changes over its history. It is up to you to research the pin-out and wiring requirements of any iPhone/iPad/iPod you intend to expand. Written and all instruments performed by Q. R. Ghazala playing erhu (Chinese fiddle), de-tuned autoharp, electric bass, electronic greeting cards, voice and percussion. Speaking voices: Neil Friedman and Susan Wheatie. Heard also: 1969 Chevy Impala trying to start, police radio noise complaint, geese taking flight and girl breathing. Recorded in a canoe on an Indiana glacial lake and at Sound Theater, Cincinnati, Ohio. Android or Apple, consider supporting experimental music app developers! Watch for posts on my Facebook page. I hope you'll enjoy your breakout! Apple has "reserved" the iPad's Line Inputs. I am an Apple beta tester and I know there is pressure within the app development circles to have apple open these inputs, and soon. I know that a certain iRig app (iShred?) responds to a line input by saying something like "input not recognized." This means the input IS recognized, but not meant to be accessed by the app. These inputs are not "dead," as has been said. I know Apple expected nothing more between your jack and their inputs other than the wiring in the diagram, as this wiring apparently works fine on other "i" devices (this means your iPod will probably work with this schematic, Line Ins active, try at own risk). Considering the pressure on Apple to open the iPad further for musicians, It would have been wrong of me not to include line inputs (remember that stereo input IS available via the USB section of the 30-pin as a DIY A/D conversion project, or via Apples new USB Camera Connector and outboard USB-Audio Compliant I/O devices (example: ART Tube MP USB Project Series Tube Microphone Preamp). So, let's hope app designers, maybe due to the popularity of this breakout and others, will get with apple to develop applications around these line-ins. Guys, I'm with you! Sometimes it's good to build a door where there was none, even if we have to bang on it!